Monel Staples are rustproof and are strong enough to be stapled into the hardest of stretcher bars, shelving, crating, etc. Monel is made from a combination of 66% Nickel and 33% Copper. Monel staples will never rust. 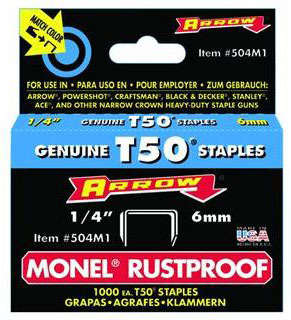 These staples are designed for Arrow brand staplers like the T-50, but will fit many other brands of staple guns. Keep in mind that these staples are not for your office stapler. A single pack has 1,000 staples.